There are many times I am stumped when it comes to birthday cards. Doesn't matter how many times I 'try', something gets lost in the shuffle... but this time.. I like! I am not sure why I chose the Pretty In Pink with Pear Parfait color combo, but, its pretty! I didn't add the sentiment to the front, since I thought it might be busy enough. I used the Owl Punch, which is fun to use! I added a 2 1/2 inch pinwheel, since my balloons weren't quite working for me! 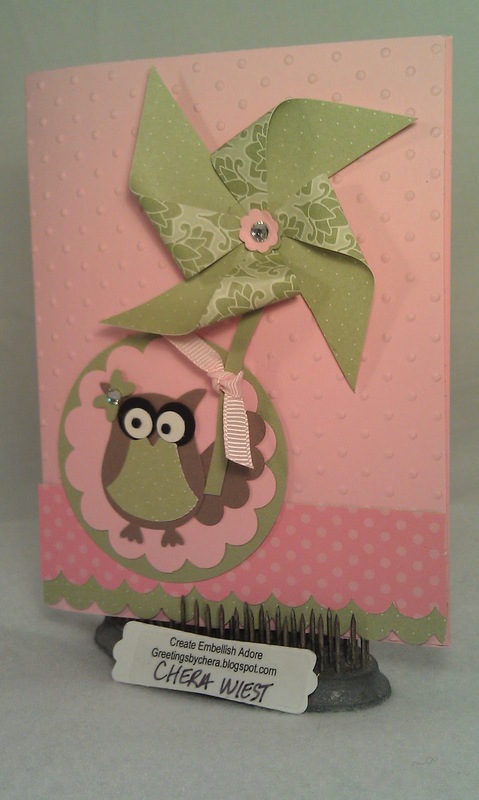 Your little owl is so cute holding the pin wheel. Love the colors.